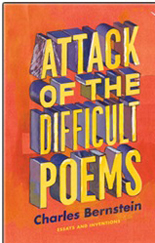 Charles Bernstein’s splendid essay collection, Attack of the Difficult Poems, is both a propitious and revelatory moment in our literary culture. We need this book. And we need Charles Bernstein. There is perhaps no one better at scanning the horizon for evidence of hostile advances on all things new, experimental, contentious, adventurous, and, therefore, central to the future of art, and particularly of poetry. Attack of the Difficult Poems is thus an heroic book, a dazzlingly informed, elegantly imagined, gallant act of exegetical aesthetics. This formulation of the problem in contemporary poetry is both proportionally correct and factually unassailable. The Language Poets, of whom Bernstein is a founding member, have made clear their philosophical commitments and yet are still charged as accessories to some indeterminate metaphysical crime, as though poetic legibility and accessibility are manifestly congruent with Truth and Justice. To be sure, any instantiation of “the difficult” in poetry must presume a concomitant critical reflex. Or to put it another way: we are being watched. Fortunately for us, Bernstein is staring right back and making his case in plain view. I am pleased, for instance, to find Donald Davidson taken decisively to task for suggesting, in a 1953 article, that parataxis in poetry erodes causality and is thus politically irresponsible. Looking to point out a fallacy in composition, Davidson commits the Fallacy of Composition. This is provocative enough coming from a philosopher (whom we love, incidentally), but to see contemporary poets of “American Official Verse Culture” tracing that same invidious chalk-outline around the corpse or corpus of whole aesthetic paradigms is worse than political irresponsibility: it is the aesthetic equivalent of investing in derivatives. Bernstein doesn’t make exactly that point, but he is unequivocal in his declarations defending experimentation, play, risk, and yes, straight-up complexity. With this book, Bernstein saves the world, not from difficulty but from its own dangerously simplistic view of difficult things.